Flash floods are not just a desert phenomena. They can occur whenver rainfall exceeds the ground surface capacity to absorb the water. 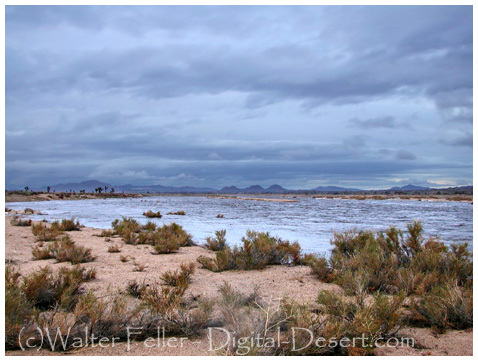 Most notably though, in the typically dry and undeveloped desert, is where flash floods can be most misleading, and deadly; even if, especially if, no storm appears to be overhead during the rainy season. Always be wary of canyons, stream beds and dry washes. Flash floods are short-term events, occurring within 6 hours of the causative event (heavy rain, dam break, levee failure, rapid, snowmelt and ice jams) and often within 2 hours of the start of high intensity rainfall. A flash flood is characterized by a rapid stream rise with depths of water that can reach well above the banks of the creek. Flash flood damage and most fatalities tend to occur in areas immediately adjacent to a stream or arroyo. Additionally, heavy rain falling on steep terrain can weaken soil and cause mud slides, damaging homes, roads and property. Flash floods can be produced when slow moving or multiple thunderstorms occur over the same area. When storms move faster, flash flooding is less likely since the rain is distributed over a broader area. Since many flash floods occur along small streams, you can determine your risk by knowing your proximity to streams. Flooding can be caused by rain that falls several miles upstream and then moves rapidly downstream. Highly populated areas have a high risk for flash floods. The construction of buildings, highways, driveways, and parking lots increases runoff by reducing the amount of rain that the ground can absorb. This runoff increases the flash flood potential. Sometimes, streams through cities and towns are routed underground into storm drains. During periods of heavy rainfall, storm drains may become overwhelmed and flood roads and buildings. Low spots, such as underpasses, underground parking garages and basements can become death traps. Embankments, known as levees, are built along the side of a river and are used to prevent high water from flooding bordering land. In 1993, many levees failed along the Mississippi River, resulting in devastating flash floods. Dam failures have played a deadly role in the history of flash flooding. The United States has about 76,000 dams, and about 80 percent of those are made of earthfill construction. Be aware of any dams upstream of your location. Earthen dams are more easily compromised by heavy rainfall than are concrete structures. Water flowing over an earthen dam can cause the dam to weaken or fail, sending a destructive wall of water downstream. Many leisure activities take place along streams and rivers. Be aware of the potential flash flood danger when you are conducting your leisure activities along small streams and rivers. Acreek only 6 inches deep in mountainous areas can swell to a 10-foot deep raging river in less than an hour if a thunderstorm inundates an area with intense rainfall. When thunderstorms are in the area, stay alert for rapidly changing conditions. You may notice the stream start to rise quickly and become muddy. You may hear a roaring sound upstream that may be a flood wave moving rapidly toward you. Head immediately for higher ground. Don't be swept away by the rapidly rising water. There are dangers associated with fast-moving water, but with common sense and some preparation, enthusiasts can enjoy a safe day along a stream or river. Almost half of all flash flood fatalities occur in vehicles. What people don’t realize is two feet of water on a bridge or highway can float most vehicles. If the water is moving rapidly, the car, truck or SUV can be swept off the bridge and into the creek. 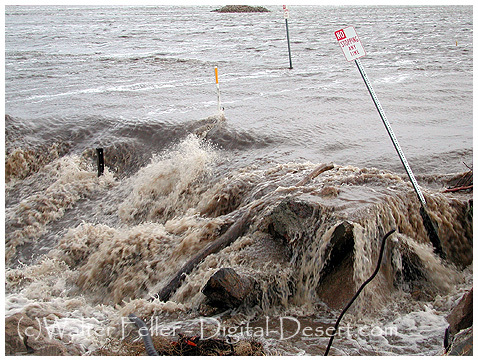 Water can erode the road bed creating unsafe driving conditions. Underpasses can fill rapidly with water, while the adjacent roadway remains clear. Driving into an underpass can quickly put you in 5-6 feet of water. Many flash floods occur at night when flooded roads are difficult to see. When you approach a flooded road, turn around and go another way. Contrary to popular belief, SUVs are typically more susceptible to floating than cars. Larger tires are more buoyant, making the vehicle float easier and causing the driver to lose control more quickly. Mountains and steep hills produce rapid runoff and quick stream response. Rocks and clay soils do not allow much water to infiltrate the ground. Steep narrow valleys generate rapid flowing waters that can rise quickly to a considerable depth. Saturated soil can also quickly lead to flash flooding. Very intense rainfall can produce flooding even on dry soil. In the West, most slot canyons and "small streams" not easily recognizable as a source of danger. Slot canyons, common in National Parks, can be scoured with sudden walls of water 10-15 feet high (e.g., Antelope Canyon, Arizona, August 1997, 11 fatalities). Flash floods occur within 6 hours of the causative event (rain, dam break, levee failure) and often within 2 hours of the start of heavy rain! Barricades are put up for your protection. Turn around and go another way! Flash flooding is often the result of heavy rainfall and therefore occurs most frequently in areas where the number of thunderstorm days is highest. Steep terrain, such as the Appalachian and Ozark mountains, the front range of the Rocky Mountains and in slot canyons of the West adds to the flash flood risk. Listen for a roaring sound upstream as flood waters could be headed your way! Look for rapidly rising water and/or water turning muddy! The force of a flash flood can easily undermine roads and be deceptive as to how deep and dangerous the water actually is.